One week after returning from an unforgettable 9 day trip to the UK hosted by Nike and Brighton & Hove Albion, Seacoast United 04/05 US Soccer Development Academy players are still sharing their experiences with everyone. During the trip, the players participated in two soccer games against Brighton & Hove Albion Academy teams and experienced 3 coaching sessions from Assistant Academy Director and former U23 Coach Ian Buckman. The group also received a training session from BHA's first team player Liam Rosenior at the American Express Elite Football Performance Center. Rosenior coached the players on Brighton’s attacking philosophy and followed that with a Q & A session. The Seacoast United players witnessed two rather entertaining soccer games over the weekend during their stay. On Saturday, the boys attended the Brighton & Hove Albion English Premier League game against Swansea City and experienced a capacity crowd go wild as Brighton dismantled Swansea in a 4-1 home victory. Sunday was certainly a day to remember for all involved as they attended the Carabao Cup Final between Manchester City and Arsenal FC, at the home of the English National team Wembley Stadium. Players and staff were positioned just off half field with the Manchester City fans and joined in with their victory celebrations at full time. The following day, the players relaxed with a 3 mile walk along a well known tourist trek called Seven Sisters Hills, which includes breathtaking views of both the ocean and a sheer cliff drop. In addition, players toured Brighton’s home ground the Amex Stadium and gained full access to all areas of the stadium to sample what life is like as a top professional soccer player in the English Premier League. 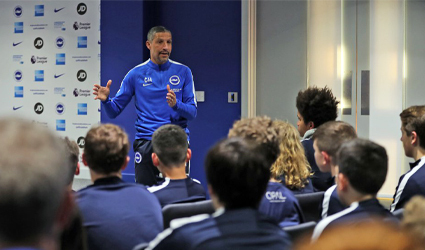 Brighton & Hove Albion's relationship with Seacoast United gave the players one further unforgettable experience: A 50-minute Q & A with First Team Manager Chris Hughton. The players took full advantage of extracting as much information from Chris as possible, with both parties exchanging views and observations on soccer in the US and Brighton. The final day of the tour saw the boys train one last time inside the all-weather dome within Brighton’s training complex. Unknown to them, the First team were training immediately following. As the SUSC boys went through their paces, they received a visit from First team striker Glen Murray. Both SUSC DA teams had watched Murray score 2 goals against Swansea earlier in their visit so you can imagine their excitement. Murray watched the boys play, provided them with advice and answered questions on his career to inspire the next generation of top players from Seacoast. On reflection the players all agreed, it was the experience of a lifetime and reaffirmed why being part of Seacoast United Development Academy really does make a difference.